Size: 360 x 160 x 50mm/14.17" x 6.3" x 1.97"
Retract the ends of the lock, flat on the steering wheel and then stretch tension. Push the front cover forward until the lock is fully engaged with the steering wheel to complete the locking action. The plastic handle of the key is protruded and aligned with the red dot on the lock core so that the upper and lower locks can be easily rotated. 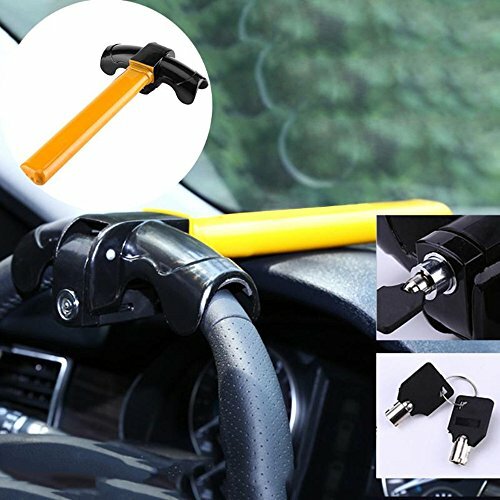 Easy to lock,5 seconds to do anti-theft measures. Steel structure special heat treatment saw continuously,protection of your car. Unique crescent-type lock core,has a powerful tooth code conversion value,anti-technical. Unique rubber protective film to protect the steering wheel from being hurt by the lock. If you have any questions about this product by Glitteringstar, contact us by completing and submitting the form below. If you are looking for a specif part number, please include it with your message.